Allen Mikaelian is a DC-based editor and writer. He received his history PhD from American University and served as editor of the American Historical Association’s magazine, Perspectives on History. The Political Uses of the Past Project collects and checks statements by elected and appointed officials. This is the second installment of what will hopefully become a regular feature of the project. Read more about the project here. 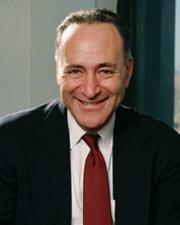 Sen. Chuck Schumer: American corporations used to believe they "had a duty not just to their shareholders but to their workers, to their communities, and to their country"
When more than 80 percent of corporate profits are going to stock buybacks and dividends, something is really wrong in the state of corporate America and the state of our economy. It wasn't always this way. From the mid-20th century up until the seventies and even into the eighties, American corporations shared a belief that they had a duty not just to their shareholders but to their workers, to their communities, and to their country, which helped them grow and prosper, along with our schools, our roads, and everything else. That created an extremely prosperous America for corporate America but also for American workers in the broad middle of this country. But over the past several decades, workers' rights have been diminished, and corporate boardrooms have been obsessed, slavishly, to shareholder earnings. Bottom Line: Most historians who responded agree that Senator Schumer is on solid ground, but their caveats and the statements of the historians who strongly disagree should not be ignored, especially if we want to use this history to help formulate policy. Scroll down for links to the historians' full responses. Senator Chuck Schumer delivered the above statement while discussing the Republican tax cuts; he charged that corporations are not using their tax savings to create jobs or pay higher wages, but are instead buying up their own shares. This can drive up stock prices by creating scarcity, and shareholders naturally love it. But the GOP's tax cuts were granted, we were told, to create jobs, not merely to further enrich investors. Schumer proposes legislation to force corporations to do good—investing “in workers and communities first”—before they can buy their own stock. And to set the stage for his proposal, he points to a past in which American corporations had a heart. Maybe that history makes his idea seem not so radical. Or it raises hopes that maybe we don’t have to be in constant battle with corporate America. That maybe our expectations for more socially responsible corporations aren’t so unreasonable. Or perhaps even that the CEOs want to do the right thing but have to be legislated into it. Regardless of why Schumer decided this piece of business history was a “useful past,” most of the historians who answered our request for input thought Schumer was on solid ground. However, we should not overlook their caveats or the dissents of historians who disagreed with Schumer’s view of history; these are perhaps more deserving of policymakers’ attention, if they really want to learn from the past. Several historians responded by mentioning the stakeholder model that captured at least the imaginations, if not the actions, of many mid-twentieth century executives: “Two competing models of corporate ownership through stocks were evident in the twentieth century: shareholder and stakeholder. The former model asserts that the leaders of corporations must make decisions based solely on the best interests of people who actually own stocks, while the latter maintains that other interested parties like workers and their communities have an interest in corporate actions equal to those of shareholders” (Jason Russell). “Earlier in the twentieth century, some management scholars such as Peter Drucker argued that corporations had different stakeholders, including the community, employees, and consumers” (Gavin Benke). “They've always cared about the bottom line, but back then felt compelled to consider the needs of multiple ‘stakeholders’” (David B. Sicilia). This was, of course easier to do when the economy was booming. The strength of unions was also a factor—they were relatively harder to ignore (Jonathan Bean)—and higher taxes made large investments in infrastructure possible (Rosemary Feurer). All this started to change at least by the 1970s (Benjamin Waterhouse, and Jason Russell pegs it to the 1960s). And with this change came a large-scale shift in thinking. Milton Friedman argued in the New York Times in 1970 that a corporation’s sole responsibility is to “increase its profits,” giving permission and intellectual heft to executives who, in the midst of globalization and declining profits, wished to focus on shareholders rather than stakeholders. Friedman was objecting “to a very real sense, both within and beyond business leadership circles, that corporations had a clear social responsibility” (Benjamin Waterhouse), but Friedman did not limit his thinking to profits and business culture: “He argued that ‘the cloak of social responsibility ... does clearly harm the foundations of a free society’” (David Hochfelder). And even further, he accused executives who took up social responsibility of “preaching pure and unadulterated socialism” and being “unwitting puppets” of the collectivist left. Schumer may be on solid ground, but if we pay close attention to these historians’ caveats and to the historians who think he is dreaming of a “golden age” (Jonathan Bean), we might ask whether the CEOs who preached social responsibility were leading the charge or merely reflecting what the public expected and what legislation demanded. “Corporations thought in wider terms about stakeholders because regulations compelled them to do so” (Jason Russell). And insofar as some corporations “may have felt a sense of civic duty” and others contributed to the public good, “they did so to comply with the much more progressive tax code at the time” (David B. Sicilia). Schumer is right to offer legislation at the same time he speaks of a now-distant past when corporations did the right thing, but his case would be stronger if he made note of how corporate virtue had to be cajoled by legislation. Schumer also leaves out a key aspect of the history of corporate responsibility, one that most of the historians here take up. Corporations had to contend with strong unions. This helped reinforce stakeholder responsibility when the morality of CEOs failed. The demise of unions was no accident, and it was not coincidental to the demise of corporate responsibility. While even the historians who agree with Schumer mention unions, the historians who disagree move unions to the center of the discussion. In the past, corporate responsibility had much to do with Congress building strong guardrails. But it did not involve Congress alone. It was not merely big government legislating big business. It was also citizens and groups like unions that forced the issue. Schumer’s job will likely be easier if his attempt to blunt the harder edges of capitalism and a return to stakeholder values also protects these groups of citizens, the actual stakeholders themselves. Browse and download citations recommended by the historians below from our Zotero library, or try our in-browser library.